New York’s Super Bowl Bid: Yeah, It’ll Be Cold. Deal With It. 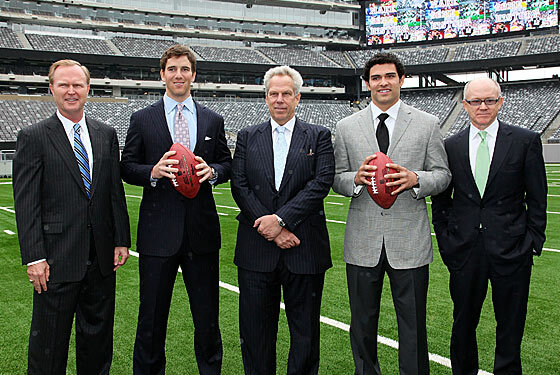 The Jets and Giants yesterday officially laid out their plans for hosting the 2014 Super Bowl — the first one, they hope, to be played in a cold-weather city without a dome. Here's their strategy, it seems: make anyone who's opposed to playing a football game in cold weather feel like a wuss for doing so. Meadowlands Stadium chief executive Mark Lamping explained how football isn't meant to be played in perfect weather anyway, while Eli Manning described the Giants' NFC title game in a freezing Lambeau Field as one his "all-time favorite games." Exclaimed Woody Johnson: "We'll be lucky if it snows!" As for the wusses among the other owners? They're free to vote for either Tampa or Miami when the host city is selected on May 25. They'd also take steps to make the experience of attending the a cold weather Super Bowl — not that there's anything wrong with that! — a not altogether miserable experience: They'd offer fans in attendance hand-warmers, blankets, and self-warming seat cushions; they'd provide fire pits in the parking lot for tailgaters; and they'd hire hundreds (or maybe thousands) of people to sweep the stadium in case of a blizzard. Also, they'd house both teams near the stadium for easy access. Not that everyone's onboard: AOL Fanhouse's Dan Graziano envisions a highly unlikely doomsday scenario in which the metropolitan area is buried underneath three feet of snow and the game is postponed until Monday. But the Daily News isn't worried, using an editorial today to support the bid. Sayeth the News: "Those who would shrink from participating in a global phenomenon because they would have to leave their Hawaiian shirts at home, along with the risk of skin cancer, are weenies undeserving of the privilege of attendance."